A few months ago, I was contacted via Flickr by a lady who wanted to interview me for a university project she was working on concerning Second Life and memory. Considering my own roots, I could hardly say no. A couple of weeks ago, she sent me the final copy of her work, and gave me permission to talk a little bit about it here. Rosengren opens her dissertation with a fantastic and interesting quote: 'Memory makes us human. Without it, people are turned into a formless mass that can be shaped into anything'. 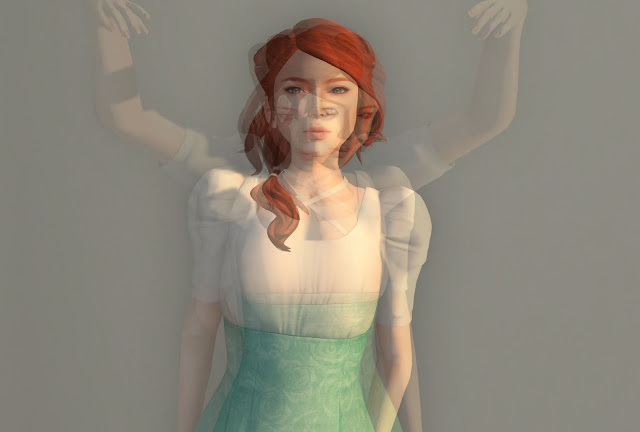 In this scenario, the SL avatar is the formless mass, and the human being behind the screen, possessing a memory, imbues the avatar with form and meaning. She goes on to theorise that if memory is required to make us human, and humans are required to make an avatar, then memory is part of the 'social foundation' of an avatar. But, of course, in a virtual world of 'constant flux with avatars and islands appearing and disappearing every minute of every day', pinning memory into the virtual world proves to be a slippery task. Of course, to complicate it further, there are a million and one studies of memory, how it works, what it constitutes, and even more about the differences between individual and social and collective memory, and more again denouncing those differences, and more yet again talking about memorialisation. During my own university degree, we looked a lot at the idea of remembering something that never happened to you, and the work of artists such as Lorie Novak who produced a haunting set of photographs (amongst a great many other things, I'm sure) that placed herself, as well as the viewer, in context with the Holocaust she was not a part of. Before we have even entered the ephemeral and intangible world of cyberspace, the issue is already hideously complex, and we could probably talk about it forever. As such, I'm going to narrow the field down here, for the sake of this blog post. I want to look at two main areas of memory and memorialisation in relation to SL that I think build on Rosengren's article. I am aware, of course, that the majority of my readers will not have read it (it has not been published, as far as I am aware), and I will explain myself accordingly. You don't need to have read it to understand what I'm going to say here, I promise. The two areas I want to look at are both acts of social/collective memory, and involve screenshots and memorial sites. I also want to float an idea that I think might sink - which you, lovely readers, can possibly help me out with. I think it's far to say that most SL users take screenshots of their experience in SL, and we take them for a variety of reasons, among them a desire to preserve some record of the otherwise ephemeral. Photographs, and memories, make our avatars substantial, and our experiences online in the virtual world authentic. I've written about this before and I am, arrogantly, going to take that discussion as standard shared knowledge (if it isn't, please forgive me). When I joined SL, I began to take screenshots of everything, especially since I knew I was going to have to report back about what I had found to my class, and again in the essay I had to write for it. Rosengren seems to have done the same thing, and there was a kind of affection, if that doesn't sound patronising, in seeing images her work that mirrored the style and content of the images I put into mine. One of Rosengren's pictures showed a wide, empty space, and her avatar in the middle of it. The caption read that this was her 'disappearing into cyberspace', and I had to laugh because I know that I have taken exactly the same picture a thousand times when Kitti lagged out at Necronom VI and decided to take a walk, without my permission, into the dark. Does anybody else have one of these pictures? Even if you didn't snap the picture, I would be amazed to find out that any SL user was not familiar with this out-of-virtual-body experience. How many other shared experiences like this are there out there, and if we compared virtual photo albums, how many of us would find we had taken the same screenshots? That idea makes me smile. To jump now to a more intentional form of social and collective memory - the building in SL of memorials. Whilst I cannot give the personal details of the person interviewed, somebody else who informed Rosengren's work talked about something she had built in SL in memory of someone who died in real life. Rosengren touched on this idea at this very personal level, but I wanted to bring to attention here the builds in SL that exist as memorials and mnemonics to bigger events in social memory. In June 2012, I blogged about a sim I came across that existed as a commemoration of those who died during 9/11. I didn't write extensively about it because there seemed, simultaneously, so much and yet absolutely nothing that needed to be said about it. At the time of writing, I have absolutely no idea if the sim is still open. I also have no idea how many other such memorial sites exist in SL, nor how often they are frequented, and by how many. Perhaps having those details would offer a greater understanding into such a sim, and help us begin to unpack the issues of memory, memorial, and preservation surrounding them. Even in the virtual world, we appear to be so afraid to forget. Here's my last idea, and it's an unfed one. Computers have memory. Computers have cookies and caches and logs and histories of all kinds. One time, I accidentally deleted a file (like, completely - it wasn't just sitting in my recycle bin) I had been working on for months, losing everything. My mum, who is a bit of a techno-wizard, managed to find some software that could retrieve large portions of the file from wherever they had hidden in the depths of my computer. In SL, the more often I seem to visit a specific sim, the more easily my laptop seems to be able to rez (load) that place - like it remembers what it looks like, and can conjure it more quickly. So...do our avatars have some kind of memory? And if they do, to refer to the opening quote of this post, does that make them human? You've told me you don't keep chat logs. i wonder how that ties into your thoughts here. I'm not wholly sure whether or not it does tie in. I got my first computer aged twelve, and it was kept in the living room where my parents could keep an eye on me. I didn't keep logs then because they used up space (honestly, I have no idea how much, but my mum was and still is fanatical about minimising wasted space) and because I didn't necessarily want my parents to read the things I'd been talking about with my high school friends on MSN Messenger. Since then, I've never kept them, and never really seen the point of keeping them. If somebody says something important, I write it down or copy and paste it into a file and save it. I rely upon my memory to remember what's been said, just as I do irl - so maybe there's the link.